I guess this had to happen sooner or later: Lego's latest and greatest Star Wars megaset is not an awesome spaceship, a short astromech or a moon-sized metal ball that makes death. 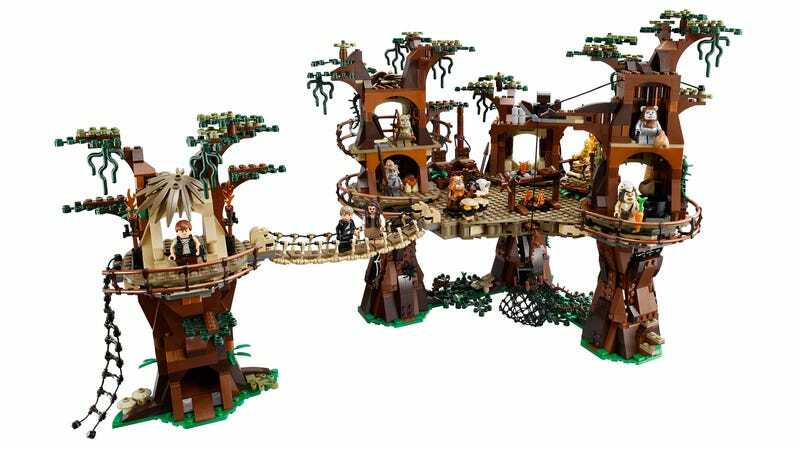 No, my dear friends, this $250 1,990-piece set is the Ewok Village. For that price, you get to build "a tree-trunk hideout, secret Lightsaber stash, spider web, net traps, slide, catapults, an elevating throne, a bridge, rope walkways, vine and leaf elements, kitchen, food storage area, bedroom and a planning room." Plus! this cool speeder bike. Lego also says that kids will love to "use the rammer function to take out the Scout Trooper’s speeder." Adults, on the other hand, will love to use a hammer to smash it—then use the great pieces to build something really cool. Like a scene from the Lord of the Rings or something. Of course, don't destroy the minifigs. Some are new and not available elsewhere, like Endor Princess Leia, Endor C-3PO, Endor Luke, Endor Han Solo and the damn Wicket. The set will be available on September 2013.